This past January, I was at a trade show called Creativation, a huge craft industry event in Phoenix, AZ. 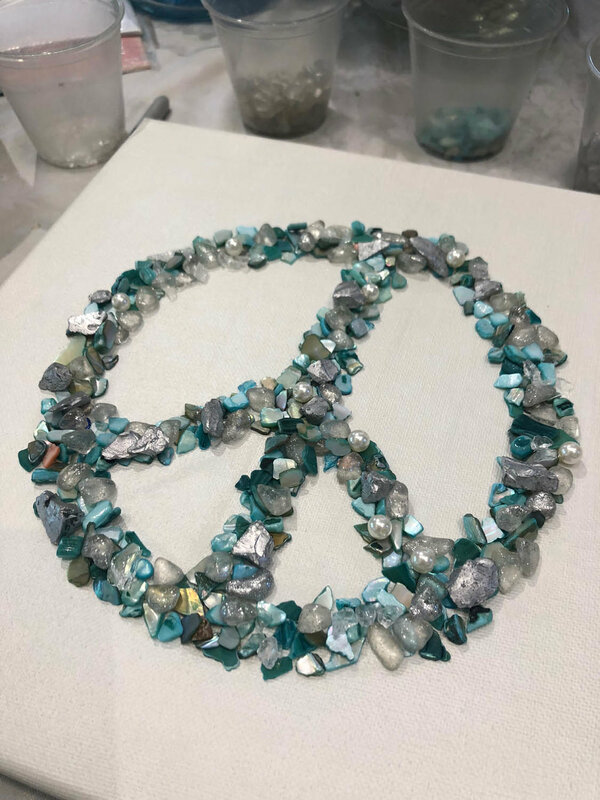 I met so many great business owners, designers, and manufacturers at the show and was fortunate enough to find one booth that really intrigued me with their creative products and art like I'd never seen—all made from glass shards! When I returned home after the trade show, I looked over my stack of business cards and remembered how much I enjoyed seeing this booth. Then I noticed where the studio locations were. One was located just a mile from where I'd be staying on an upcoming trip with my best friend! We were traveling to Grayton beach in the Pan-handle region of Florida, not far from where I grew up. We stayed in Watercolor, Florida—the perfect spot for a relaxing and inspirational trip and it just happened to be very close to Mary Hong's studio, the artist that creates this lovely glass art. Shards of glass, scraps and notions of all kinds are used on canvas, wood, or pretty much any other surface to create this unique art. Mary's studio is in an area in Grayton Beach with adorable cottages housing coffee shops, galleries, seafood restaurants and studios. Mary also owns The Shard Shop next door to her art gallery. At The Shard Shop, they host classes and have every supply needed to create your own piece of art...no experience needed! Lisa and I enjoyed perusing the studio where Mary displays her amazing art and then we attended a really fun class next door at her workshop, where guests of any artistic talent can experience making art, combining glass on a pre-painted canvas! I made a Peace sign on canvas and Lisa made starfish on a a painted piece of wood. 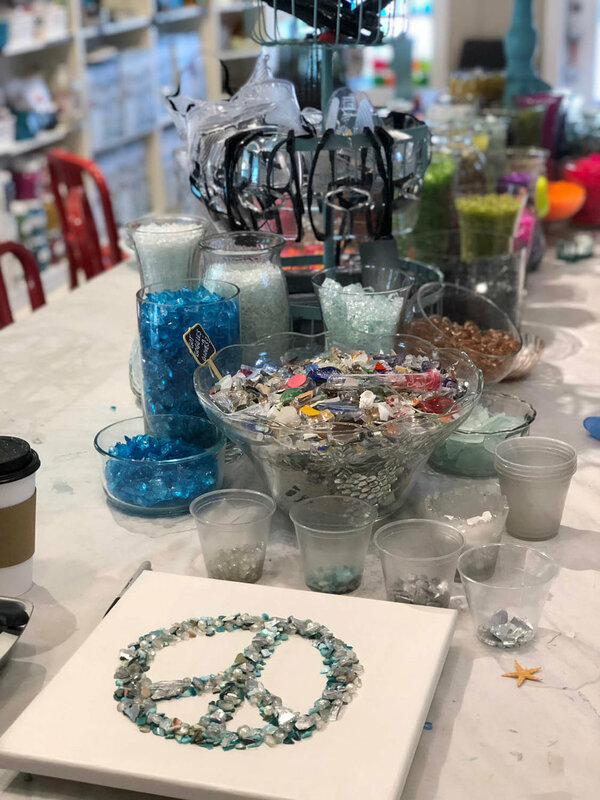 At The Shard Shop, anyone over 6 years old can attend a class and choose from beautiful colors of glass, scraps of all sorts, and odds and ends like pieces of jewelry, pebbles or seashells. The shop keeps your art overnight to apply a resin coating to your creation to secure all the pieces on your chosen canvas. It's amazing how the resin holds even the most dimensional pieces in place! You can begin your artwork by tracing a template (like I did) or creating your own design. It's a very forgiving art since you can change or alter your design as you create. Until the resin coat is applied to the finished piece you can experiment as much as you like! The Shard Shop also sells supplies and kits for those who can't attend a class in person. We attended the class at the Grayton Beach studio, but there are also locations in Destin, Florida and New Orleans, Louisiana. If you can't make it to a class, be sure to look on the website for her art kits at ShardShop.com. I hope to go back one day, but in the meantime I have my pretty creation to hang on my wall! You might also enjoy Cottage Style Reigns: Beach Getaway Inspires Creativity and other posts in Lifestyle & Travel and DIY & Crafts!